Rob: Ok well let’s get rolling. Welcome to our friends, our family, our Becoming Your Best podcast listeners wherever you find yourself in the world welcome. Before we get going on this podcast a couple of things. Number one there are some big announcements coming here in the near future and these will impact each one of us. And so we’re excited to announce these they’ll be rolling out here in the next two to three weeks so keep your eyes and ears out on Facebook, Instagram, you’ll definitely hear it here on the podcast but there are some big things coming in, so we’re excited about that. Now this podcast is going to be a little bit of a different one for me, because I’m going to lump myself right in there and what I mean by that is I’m going to start this at the same time I’m inviting you to start this and I haven’t explained what this is yet. This is a big, big deal in our lives and can have a really dramatic impact on our relationships, our finances, our success, and the way that we really look at and feel about ourselves. But before we get started I’d like you to take a look at the person on your left or right. If you’re in an office setting right now just look around the office. If you’re alone obviously you can’t do that. Visualize in your mind some of the people who are close to you in your life. If you’re alone, the point is that you have someone in mind or someone that you can look at and actually see. Now don’t you think it would be a safe assumption to assume that that person is going through a challenge or a trial that we know nothing about. I mean it could be related to money, finances. It could be a relationship issue with a spouse or a son or daughter, or maybe it’s just generally how they’re feeling in life. I mean we all have our Goliaths, and can’t you relate to this, where maybe they’re just something that you’re going through and you feel like you’re alone in that battle and no one else may be gone through that or can relate to it like you do. Either way let me give you an example of what we’re talking about here. My mom, for those who may know her, is an absolutely incredible lady just one of the idols of my life. I’ve loved her, wanted to become like her in so many different ways through the years. She was my go-to person when I was growing up. If I had a concern or a problem many times she would just listen, and I really loved her for that. And then at 55 years old she was diagnosed with early onset Alzheimer’s and this was a game changer in our family. You fast forward the clock just seven or eight years later and at this point she can’t even really form a coherent sentence. So you have this brilliant, amazing lady who never got less than an A, people love her, and she’s just a shell of who she once was. You can see and feel that internally she’s still there, but she can’t articulate she can’t have a conversation. And we’ve really lost the person who we’d known and over the last few months it’s really caused me to reflect that life is fragile and we only have a finite amount of time in this world. We each have this fire inside of us that’s waiting to be ignited and this fire can become a roaring flame if we unleash it. And this is the time for each of us to face our own Goliaths, to make our areas of improvements become our strengths. And the truth is tomorrow is not guaranteed for any one of us. And that’s exactly why we’re here on this podcast is in the spirit of becoming our very best, what can we do that can have a dramatic impact in our life? And of course the 12 Principles, the Six Step Process, all of those are absolutely critical. You’ve seen them, you’ve heard them, and many of you have felt the power of them in your life. Well we’re going to zero in on something that I’ve not really talked about before and I’ve done it a little bit throughout my life but never really developed the habit of doing it. And that is about to change, and maybe you can relate to this. I mean it’s something that we’ve heard about many times throughout our lives. And notice I haven’t said what that is yet. 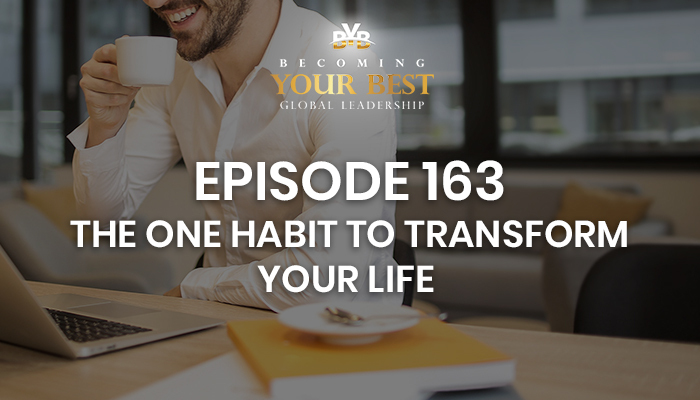 And yet very few of us still do it even though we’re all familiar with we’ve heard this term many times until now and I’m inviting everyone on this podcast to join me in developing and committing to this habit. And we’re going to go through some ways that can actually help us do this. Now when researching the habits of great leaders, these high performers, when we were looking and identifying and finding the twelve principles there was a habit that emerged in there and it pertains to the twelve principles but it’s very individual, not a principal, it’s a specific habit. Now when I share this habit that I’m sure you’re saying “Rob, just get to it.” But when I actually share this there will be a lot of people who immediately say “you know I’ve tried it and it didn’t really work for me” or, “man you know I started doing that way back when, and I just didn’t ever maintain the habit.” Well I’m one of those people. I can relate to this. And many of the great leaders we researched had this habit. Now are you ready for it? The habit is this: journaling. Now don’t hit stop, don’t stop this podcast, don’t turn down the speakers, because I’m an invite you to do something in a way that most likely we’ve never done it before. If you look back at some of the greatest leaders through history this is one of the habits that they developed and it’s what allowed their minds to really unleash this fire, you know, to expand their thinking to develop these expansive visions that most people laughed at or said is impossible. Leonardo da Vinci – he had a helicopter drawn in his journal. I mean can you imagine that? Nelson Mandela, Washington, Lincoln, and so on. Many of these people had this habit of journaling, so why is it so difficult? Why is this something that is so hard for most of us to do. I mean, many want to develop this habit. Here’s what I’ve come across in my own life. I’ve periodically done this. You know I served two years as a service missionary in Bolivia and that was probably the only time I had the semi-consistent habit of doing this, and thank heavens I did because I’ll look back and read some of my entries and without fail, 90 percent of what I wrote down was gone from my memory and had I not written it down I would’ve completely missed and forgotten about those incredible life changing experiences. And so as I’ve recommitted to this, I said you know I know that this is a high-performance habit. Why am I not doing it? And what I found as I’ve talked with friends and over the last month, I really spent a lot of time going over different journaling techniques what’s working what doesn’t. I’ve asked people what do you do? What hasn’t worked for you? And these are some of the people who have developed this habit and I’ve really found that for most of us who don’t have this as a habit in our lives it’s simply because we don’t know where to start. You know we know go get a journal and then do what with it? What do you write in the journal? I mean I can relate to that and maybe you can relate to that as well. So I can understand I can empathize with a lot of people out there who say I know it’s important, but what now? And that’s what the next few minutes on this podcast are gonna be about, what now. And I invite you to take this habit and really make it a habit. You know the things that we do with our time ultimately are the things that matter most to us. And this single habit of journaling really will amplify what matters most to us. So over the last month in my own personal research of journaling habits and techniques and what makes journaling successful I put together a list of some of those things. We’re actually to add this to our Breakthrough Leadership Conference that we have in April and October. We’re going to go a little bit deeper into journaling techniques and how that can really impact your life, your business, your relationships. For right now though I just want to make an introductory thought and invite you to join me over the next four weeks in actively journaling and see what it does. And I say see because I’m right in there with you on this. So here are some of the things that I’ve found over the last few weeks that can really have a big impact. Number one get a nice journal or notebook because your posterity may read this. Your grandchildren, your great grandchildren may read this. So this may not be the one where you want to spend just two dollars on, you know, go get a nice leather-bound journal something that can really endure through generations. I have a friend who runs a company and I went down and got this nice leather bound well just call it a journal. I had these blank pages inside and it’s a special paper that in theory is supposed last for hundreds of years. So the point is to actually just go get a notebook or journal, but don’t procrastinate this. You know the art is in the start. You don’t have to be great to start but you have to start to be great. And so I’m inviting you in the next couple of days. Go get a journal. And if you can’t find a nice leather-bound one, man just get something and let’s start this together. Next in the front of the journal, put your name your address your phone number and your email and write on top of it. “Return for a fifty dollar reward if found,” because fifty dollars should be almost nothing compared to what can be found in this journal. Fifty dollars is easy and that’s where someone’s time and effort to actually return it to you if you lose it and they find it. So that’ll help you if it gets lost. I’ve actually talked to several people who say they had these amazing journals and then they lost them all and that would be heartbreaking. And this is a little bit different. It’s not an online journal, that will come later, but this is something that you’re actually physically are writing not typing. Another helpful tip that I’ve learned from some people over the last few weeks is to number the pages in the corner. Obviously the first page will be number one, two, three, four and then in the back leave four pages or so where you can keep an index. And as you have interesting thoughts and ideas or things that come along you can actually after you’ve done writing in the journal go back to the index and put one of the keywords in there and what page it’s found on. And that way you can go to your index once the book is full and really save yourself a lot of time. You know if there’s something you’re thinking about, oh I remember that that’s right. What page is that on? 45. You don’t have to waste your time looking for the page. All right. So let’s talk about the start, that’s getting going. Now how do you actually do the journaling? So here’s a couple things that I’ve found. Lots of books would support this. And this is why I’m committing to doing this. If it’s something that can take us and make us better, good better best. Then why are we not doing it? So number one is to set aside five to 10 minutes in the evening just before bed. And the reason that we’re gonna use this time to do it is because there are so many studies that support what we do just prior to closing our eyes will permeate into the subconscious of our mind, and our subconscious will find ideas and solutions to what we are thinking about just prior to going to bed. And that’s why the exact opposite, the worst things we can do are to watch TV right before bed. You know watch a little video or movie because we go to sleep and our mind is focused then on that, where if we can use this high-performance time, this five to 10 minutes to zero in on the things that matter most in our life then our subconscious mind can go to work on finding solutions while we sleep. I mean isn’t it true that many of your good ideas come early in the morning. Can you relate to that where you’re sitting there, you’re half awake, you’re half asleep and you had this idea and you say “oh this is such an awesome idea.” And many times we don’t write it down and then what happens when we wake up. I mean this has happened to me many times where I say, “oh come on. What was that idea? It was amazing.” And I just for the life of me can’t remember what it was. So the point is we’re training our subconscious mind and putting in a position where it can work for us while we’re sleeping. And that’s why this five to ten minutes prior to laying down becomes the critical time. And then if you would like to, to take it up a notch, I’m not asking us to commit to too much in the beginning. So consider that the bachelor’s degree. That’s the start. If we want to go to the MBA, PhD level and that may happen in three or four weeks. Right now I’m going to focus on the evening. The other clear indicator of success are people who wake up in the morning and one of the first things they do is go to their journal because it really sets the alignment for the day. Right now though, I’m just going to invite all of us if this is not something that’s an active part of your day your habits, to start with the evening. Five to ten minutes prior to going to bed. We can all do that. Not a single person who can’t do it if they have the desire to do it. All right. So let’s really get into the start now. You go out, you get the journal, you number the pages, you make a place for the index you allocate the time to do it. Where do you actually start? And this has been one of the most difficult parts for me personally and for many other people who I’ve talked with about this idea. So none of these are concrete firm questions that you need to answer. Rather I’m going to invite you to come back and relisten to this part a couple of different times and actually write some of these down, because these are questions that can help get you going in writing. If you’re similar to me many times you just sit there look at a blank page and ask yourself what do we write? Well here are seven to eight questions that can spur ideas of what you can write in that five to ten minutes in the evening. Again no one of these questions specifically do you have to do. Just choose one or two or three and get started on this. This will give you something to write as you get started. And then as we develop this habit together it’s gonna become easier and easier and easier as we develop the habit. So let’s get going on this here are some questions that you can think about in that five to ten minute window. What are some small wins from the day? Let me say that again. What are some small wins from the day? Isn’t that an awesome question? And think about if you’re actually articulating that out and you’re taking just one to two minutes to write out some of your wins for the day. And isn’t it true where there’s some days that just simply go better than others, and some days you’re just looking for the one win. That’s what we’re doing, we’re focusing on the positive we’re setting our subconscious mind in the right frame to make the next day an even better day. So what are some small wins from the day? Here’s another question you could ask yourself. Is there a quote or something you heard that day that inspired you? Good question. For example you know I heard someone say a few weeks back the best definition of success they’ve ever heard is this, “how you feel about yourself when you’re by yourself is how successful you truly are.” Man that’s an awesome quote so I wrote it down and I kept it and I committed it to memory, and I realized just this morning that after not saying it for three or four weeks I’d almost lost it. And thank heavens it came back this morning but that’s the idea is if you hear something inspirational capture it. Okay here’s the next one. Write your affirmations. If you don’t currently have some affirmations that you’re using on a daily basis. Great. This is your chance to write them down. Commit them to memory and make them your affirmations. Today is going to be a great day. I’m a kind and caring husband who always helps Tonya feel like a 10. Everything’s working in our favor. These are examples of affirmations because what we think about and what we talk about is what we bring about. OK here’s another question for you. What are you grateful for today? And again maybe there are some days where this is just awesome, and you can fill the whole page just on a gratitude page. There are other days that maybe don’t go so well. And this will help lift our spirits a little bit and say you know what, maybe the day wasn’t so bad. Maybe it was actually pretty fortunate and pretty amazing because we have our health, we have a home, we have this and that and just answering that question can shift our mood. So what are you grateful for today? Now I’m gonna shift back to me. What’s something that I would like to improve tomorrow? And here’s where we don’t make a negative statement about ourselves. Let’s say we lost our cool with one of our sons or daughters and we say, “dang it you know I really wish I wouldn’t have done that.” So instead of saying you know I’m gonna quit being a bad parent, that’s a negative way to phrase it that’s not the intent of this. What’s something I would like to improve tomorrow? Tomorrow I would like to spend and invest more meaningful time with my son or daughter where I’m actively being present and really listening to them. See how that’s phrased in a positive way of something we can do tomorrow. I’m not going to lose my temper again or something like that. So we’ve focused on what we can do in the positive. Again we’re setting the intention for our subconscious to go to work. Here’s another question. What can you let go of today? Phew. That can be a powerful question for some of us especially if it’s something that’s really binding you and holding you down. What can you let go of today? OK. Here’s another question. What’s a great memory from your life? So if you’re just struggling to come up with ideas to answer any of those other questions look back on something. That’s an easy one. This is like the pitch that comes right over the plate that sets us up to hit a homerun. Any of us should be able to answer this one, what’s a great memory from your life? Just search back and think of one. Write it down. OK. Here are two more. The last two. What’s an annual goal that you’re excited about and that you can work on this week? And here’s one last one as a starting point, write a question to reframe the problem that might be plaguing you. So if finances are a challenge in your life maybe you can rephrase this instead saying I’m broke, bad things always happen to me, nothing ever works out. No that’s the wrong language. Maybe you could rephrase this into a form of a question and again let your subconscious work on it throughout the night. How do I generate $5000 a month in passive income? It’s a positive. It’s a question. Let’s see what my mind can do and start going to work on this. But if we don’t do anything what’s going to change? Absolutely nothing. And this is why we start journaling because it starts to invigorate the mind. It lights this fire within us. And this is why I’m so passionate about starting and committing to this. So here are a few sample questions, let me just reread them quickly with no commentary. What are some small wins from the day? Is there a quote or something you heard that inspired you today? Write your affirmations? What are you grateful for today? What’s something I would like to improve tomorrow? What can you let go of today? What’s a great memory from your life? What’s an annual goal that you’re excited about working on this week? And the last one, write a question to reframe the problem that plagues you. This is it. So my invitation is over the next four weeks, you, if you’re willing to do this, commit to actively journaling. I’ve already invested in mine. If you would like a Becoming Your Best journal, we’re actually going to take this a lot more seriously. We’re working on creating a high performance journal like this that has some helpful ideas in it and that’ll be available down the road. Go on Amazon and you’ll find another thousand on Amazon. The point is let’s get that in front of us. And for me I’m going to have it sitting right next to my bed with a pen. So there’s no excuse. It’ll be right there on the bed. I know that I’m going to allocate five to ten minutes just prior to going to bed and initially I’m to keep some of these questions in front of me and then it’s not gonna be a matter of what do I write. It’s just a matter of how much do I write. And so I hope you’re willing to try this with me and actually try is the wrong word. I hope you’re willing to do this with me. And I would love to hear what happens over the next four weeks with you. You know, write us an email support@becomingyourbest.com. Share your experience. Because this is and can be a life changing habit. So I hope this was helpful for you. Wherever you’re out in the world. Wish we could reach out say hi, shake hands, give you a big hug. Between now and then, again I mentioned earlier that there’s a big announcement coming there’s actually a couple of them so stay tuned over the next two to three weeks because this will be awesome you’re going to love this, some new things that are coming out that can really have a big impact in our lives. So again thanks for joining us today. Wishing you a fabulous week.